One of the most famous psychological tests ever committed – and those involved with it – becomes the focus of 2015’s Experimenter. Set in 1961, Yale researcher Stanley Milgram (Peter Sarsgaard) conducts a study in which associates order subjects to give electric shocks to strangers, even when it becomes clear these actions cause immense harm to the victims. Though that should be “victims”, as the electric chares are faked, and the “victims” simply pretend to be in pain. Milgram’s work creates a sensation – and a controversy, as some question the ethics of his study. Experimenter explores the reaction to these efforts, and we see what happens to Milgram and his wife Sasha (Winona Ryder). If you want tremendous insight into Milgram’s life, you won’t get it from Experimenter, which is fine with me – mostly. 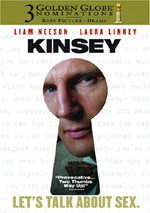 The movie largely concentrates on his research, so we get a moderate impression of his personal life but we mainly learn about Milgram’s work and the related ramifications. In that vein, the film works well. It tends to feel like an endorsement of Milgram’s research, with an “end justifies the means” vibe on display. However, Experimenter makes sure that it presents the other side of the story. It may invest more in the pro-Milgram view, but it gives us the alternate view in a satisfying manner. As for Milgram’s personal life, that comes out less well. We get some sense of the man and his motives, but that side of things doesn’t receive as much exploration as one might like. At least this means the film avoids the “TV movie” pitfalls that could come along for the ride, as attempts to “explain” Milgram would probably become cheesy and simplistic. All of this means that Experimenter never becomes an especially introspective work, but it remains interesting and intriguing most of the time. Though a few missteps pop up along the way – particularly due to awkward GoodFellas-style narration – the end result satisfies. Experimenter appears in an aspect ratio of approximately 1.78:1 on this Blu-ray Disc. While not the most dynamic Blu-ray I’ve seen, the image satisfied. For the most part, sharpness appeared fine. Occasional shots showed a bit of softness, but nothing too fuzzy emerged, so the majority of the film offered good clarity. I noticed no issues with shimmering or jagged edges, and edge haloes were minor at worst. Source flaws remained absent. As one might expect from a period flick like this, Experimenter provided a subdued palette. Colors tended toward a desaturated, semi-teal bent, but they seemed clear and well-developed within those constraints. Blacks showed good depth and darkness, while shadows were solid. This became an acceptable presentation. Given the film’s character scope, the DTS-HD MA 5.1 soundtrack of Experimenter didn’t boast a great deal of dynamic material. The soundscape stayed with environmental information and little more. There wasn’t much to stand out, but the track did what it needed to do. Audio quality was good. Speech was natural and concise, as the lines lacked noticeable concerns. Music appeared full and rich, with solid range. Effects didn’t have a ton to do, but they were full and clear; the occasional louder elements showed positive punch as well. While nothing here impressed, the track still was good enough for a “B-“. A few extras ensue. 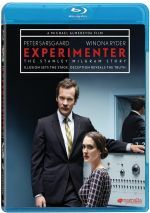 The Making of Experimenter runs five minutes, 51 seconds and includes comments from producers Aimee Schoof, Fabio Golonbek and Uri Singer, widow Alexandra Menkin Milgram, and actors Peter Sarsgaard, Jim Gaffigan, Taryn Manning, and Anthony Edwards. The program looks at story/characters as well as cast and performances. This offers a basic promotional piece. Next we get an Interview with Joel Milgram. In this five-minute, 33-second piece, we hear from Stanley Milgram’s brother as he discusses his brother’s life. I like the ability to see someone close to Stanley, but we don’t learn a ton here. Finally, we go to Designing Experimenter. It lasts five minutes, 10 seconds and provides info from production designer Deanna Sidney as she discusses sets and visual design. Though brief, this becomes the most informative of the three featurettes. The disc opens with ads for Steve Jobs: The Man in the Machine, Best of Enemies, Sunshine Superman and Drunk, Stoned, Brilliant, Dead: The Story of the National Lampoon. No trailer for Experimenter shows up here. Pioneering psychological work comes to the fore in the mostly satisfying Experimenter. Though the movie could offer more character development, it still becomes an interesting examination of famous experiments. The Blu-ray brings us good picture and audio but lacks substantial bonus materials. For the most part, this becomes a solid effort.